The 34th Battalion was formed in January 1916 at a camp in the Maitland Showground. The bulk of the recruits were drawn from the Maitland area, hence the connotation. The 35th battalion was formed in December 1915 at Broadmeadow camp Newcastle and, like the 34th was predominantly made up of enlisted men from and around Newcastle. 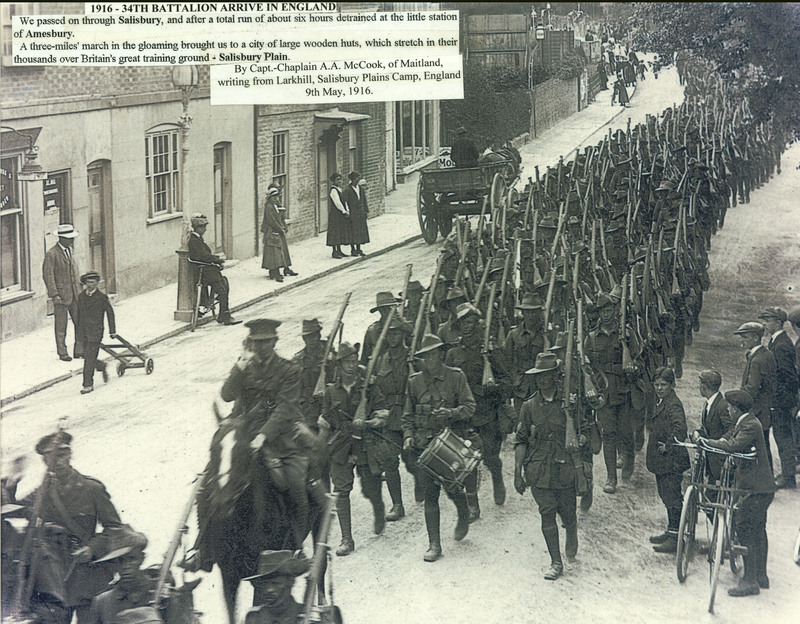 Both Battalions embarked from Sydney on the 1st May (35th) and 2nd May (34th) 1916 for firstly, England and ultimately the battlefields of Europe on the ‘Western Front’. These included Messines, Passchendaele, Amiens, and Villers-Bretonneux. The 34th Battalion arrive in England, c. 1916. From the archives of the Coalfields Heritage Group.